Another massive week for Heelo. The number of big household names that will be using Heelo in Q1 2019 is going to turn heads. Ron, perhaps along your theme. Freedom of choice is an illusion. 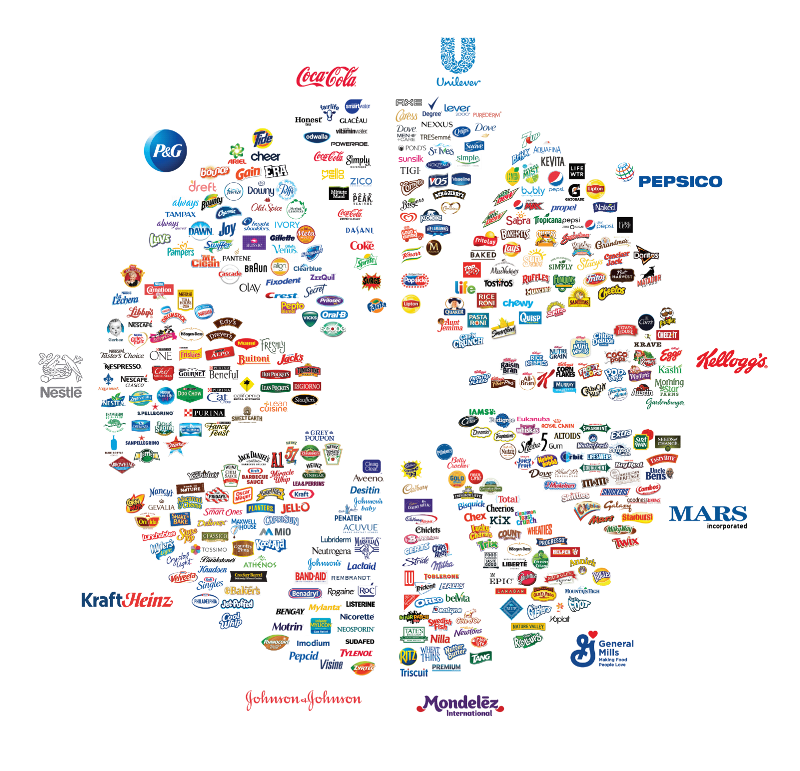 These 11 companies control everything you buy, grocery, consumables. Sounds like a big deal to me. I will ante up in the financing. For comparison, lets say you develop a superior technology or compound to make auto tires far better than anything on the market today. You could go to the tire stores, the Canadian tire and Walmarts and have them carry your tires. You then do a lot of advertising educating and convincing buyers to try your tires. You sell it and get the endorsements from say GM, Ford, Hyundai and NASCAR. Some prominent racers at NASCAR use your tires and the 3 auto companies install them on all their new cars. This will make your sales much easier and your market penetration much faster and all of it for less cost. Congrats to Roy and his sales team. They knocked King Kong out of the park today. Amazing, it is like winning the super bowl and world series at once. There will be a pilot project in January and if it goes well - as we know it will, Heelo will be across Canada next year in about 70% of the retail market. These words could not come from anyone more powerful in Canadian retail. They told Roy, he could be 'the one'. Referring to the matrix movie, so I guess the retail matrix? If that was not enough, they knocked an elephant out of the park in another meeting. Nobody is saying no - Unbelievable!!!!!!! GB, Heelo has been like a Stealth bomber cruising up there for the last 2 years and just dropped it's package about 6 weeks ago. We deliberately started off as Heelo coupons as a disguise of what we were really doing. This was to keep off the radar of competitors. Oh! Heelo, just another coupon company. Heelo is better described as a proximity notification system. We often call it the 'Heelo ping system'. We are finding strong demand by large retailers to use it in the back office as a communication and management tool for employees. Habitat for Humanity is doing this and we are working with them to make some additions to the system to make it more robust. For real estate, agents would deploy Heelo beacons at their listings and information and virtual tours could be presented over prospective buyers smart phones. Cities and municipalities will use Heelo to provide information for visitors, tourists and special events. In the objectives, real estate and insurance was mentioned. I thought Heelo was for coupons and discounts. How does it work for real estate? alex, about a year and half ago, Heelo hired outside consultants in the tech/mobile sector in the U.S. and Canada to review and suggest improvements to the business plan. There one main point was to keep projections low and easy to defend. The 50k is a very low and conservative number. I have mentioned Grubhub, I believe around 46k restaurants, but they just service take out food in that sector. They will not service hardware stores, pet stores, auto, clothing, medical, real estate, muncipalities, hotels etc. etc. Heelo's reach is vast. However, just restaurants in Canada was 72k back in 2012, Heelo could be in the majority. Heelo has about 10k to 15k locations at the table now. That number could triple this week, depending on how a few meetings go. Next year will be a challenge of implementation and keeping up to sales flow. The presentation gives a revenue run rate of $55 million at the end of 2019 and that is based around that 50k location number. It does not include transaction revenue that was hard to estimate without an install base, but those numbers will come next year. Ron, thanks for sending out sales plan etc. A projection of 50,000 locations by end of 2019 seems like a big number. If reached what kind of annual revenue would that be?